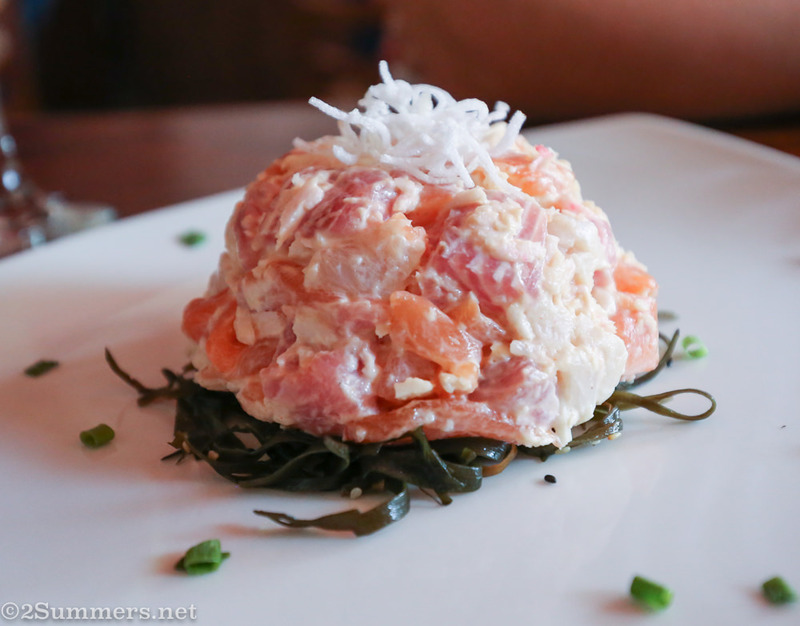 This is a quick post to inform you of a good sushi restaurant in Johannesburg. Having spent most of my life on the American east coast, where great sushi restaurants abound, I struggle to find decent sushi in Joburg. The fish is often bland and lacking in variety, there is too much mayonnaise, and the sushi rolls are uncreative. I suppose this should come as no surprise; Joburg is a land-locked city and there aren’t many Japanese people around. But similar to my quest for good Jozi Mexican food, my quest for good Jozi sushi is ongoing. 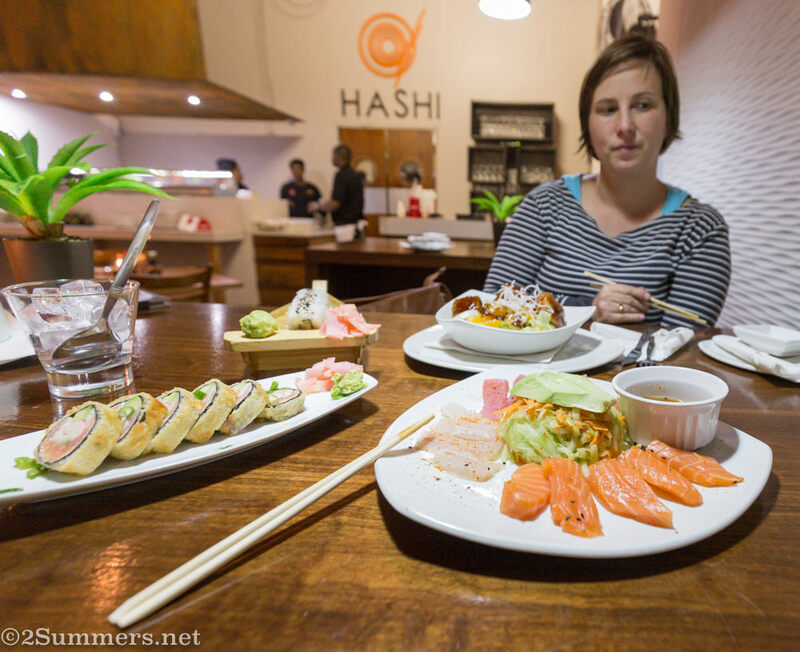 I have discovered a few exceptions to the bland Joburg sushi rule, and Hashi is one of them. 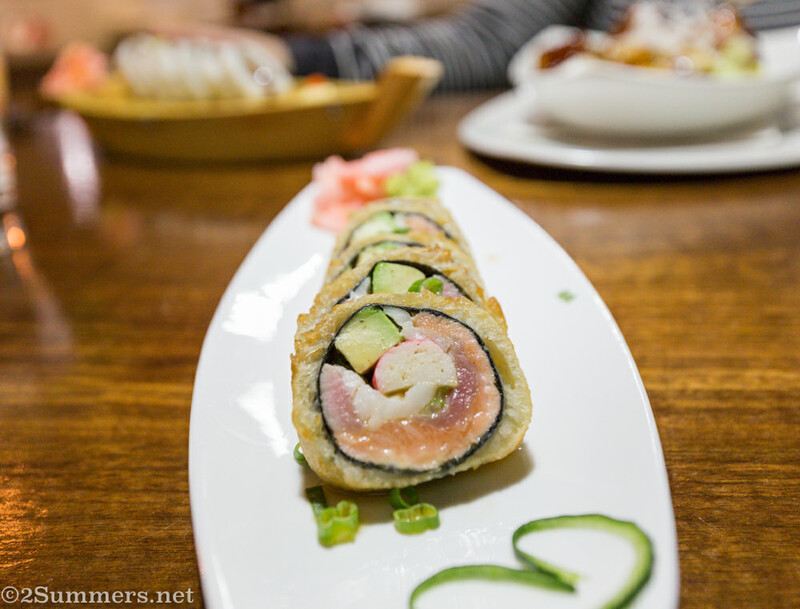 Hashi Fusion Japanese Cuisine, on 7th Street in Linden, is an actual Japanese restaurant, rather than an Asian restaurant that threw some sushi on the menu as an afterthought. They have all kinds of crazy sushi roll combinations that I haven’t seen anywhere else before, which is a sign of a good sushi restaurant in my opinion. The fish is fresh and the sushi is well crafted. 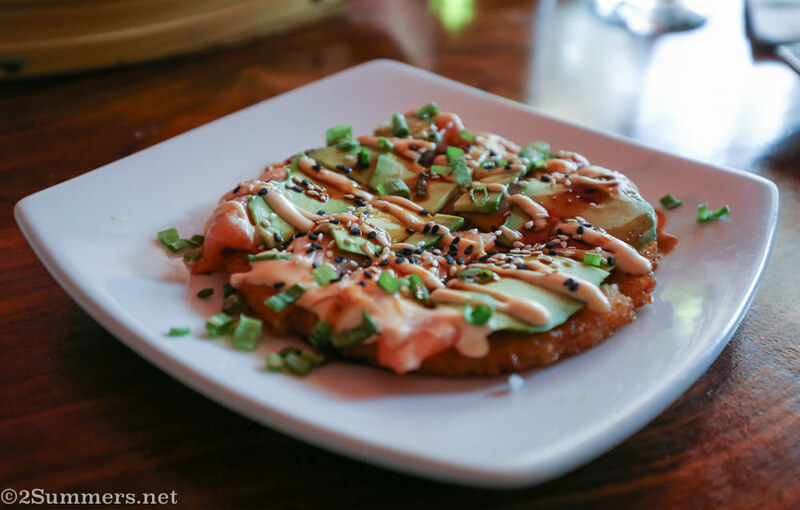 Hashi also serves sushi pizza. I wish I could remember what this dish — a delicious ball of fish over a bed of seaweed — is called. We ordered it the first time I went to Hashi and it was delicious. Then I tried to order it the next time but couldn’t figure out what it was on the menu. Hashi’s menu is huge and it takes some studying to make an informed order. Dinner at Hashi with my friend Nina. I love the zen manner in which Nina is gripping her chopsticks. A sushi platter ordered with friends. If you’re not South African, you might wonder what those sandwich-shaped things on the left side of the platter are. Those, my friends, are fashion sandwiches — a sushi phenomenon that only occurs in South Africa, as far as I know. (Someone please correct me if I’m wrong on this.) Fashion sandwiches are exactly what they sound like: sushi sandwiches in which the filling is raw fish and the “bread” is sushi rice. I personally am not a huge fan of fashion sandwiches, as they usually have too much rice and mayo and not enough fish. The Hashi version isn’t bad though — still too much rice but at least the sandwiches aren’t drowning in mayo. In addition to sushi, Hashi serves tempura and other types of Japanese cuisine. Hashi’s salads are particularly innovative. Hashi also has a nice atmosphere, efficient service, and a great location in Linden, which is becoming one of Joburg’s best foodie suburbs. Hashi isn’t the only good sushi restaurant in Joburg. I also recommend The Blackanese in Maboneng, which serves an interesting Afro-Asian take on sushi, and Yamato in Illovo, which is definitely the most authentic Japanese restaurant in town. Koi is Rosebank is pretty good too, but it’s a bit too trendy and expensive for me. Do you have more good Jozi sushi suggestions? Bring’em on. Thanks for the tip, Heather; I will definitely go and try Hashi. How were the prices? The most authentic Japanese restaurant in Joburg to me is Japa in Rivonia. The food is phenomenal and on a given night the restaurant can be packed with Japanese business-people. 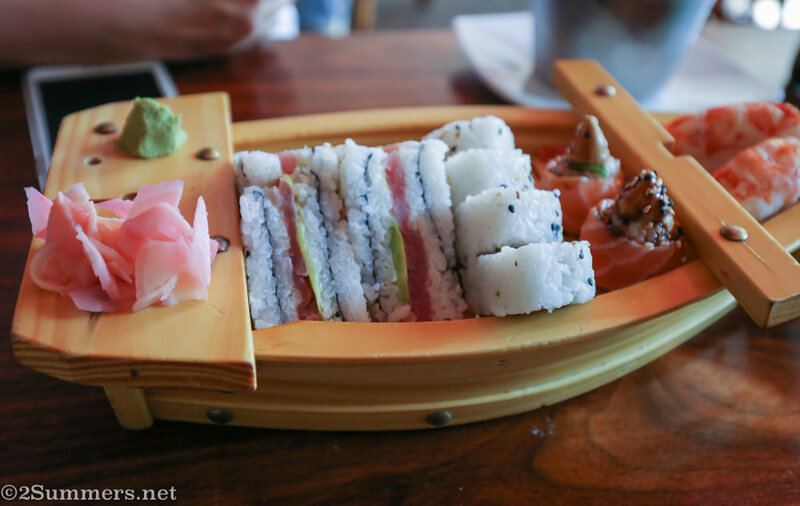 The variety is fantastic – must more than Sushi – and the sushi is so fresh… so even though the service isn’t very good, and it’s a bit of a trek from where I live, this remains my all-time favorite Japanese restaurant. Be ready to fork out some money though! Hi Julie, great to hear from you! And thanks to you as well for the tip. Rivonia is definitely one of the best places for Asian food in Joburg. I’ve never been to Japa though — will have to try it. The prices at Hashi are extremely reasonable — cheaper than the average Joburg sushi I would say. No, but you are the second person to mention Japa in these comments! Clearly I need to get there stat. Heya – interesting post – I’ll have to check them out. Best sushi in SA is definitely at Willoughby’s in Cape Town , but tops in Gauteng is Yamitsuki in Bedfordview by a LONG shot ! Interesting -never heard of Yamitsuki. Will have to check it out. I am probably not qualified to answer as I don’t eat fish lol, but I wanted to put a word out for vegetarian sushi. The best I have found so far is suprisingly at Montecasino, YuMe. i don’t like eating at Monte in general, and YuMe has no atmosphere whatsoever but their veg selections are really different and tasty to the usual avo or cucumber rolls. Or worse, the dreaded fashion sandwich, definitely agree with you on that one! I looked at the menu for Hashi and it certainly looks like it is worth a try, even for non fish eaters. Thank you! I just moved from Norwood to Northcliff and couldn’t justifying driving out to Hokkaido to pick up sushi but also didn’t feel adventurous enough to try my way through all the Chinese joints. This sounds just perfect and is around the corner! I’m also a big sushi fan and will go out of my way for either high-end authenticity or low-end all-you-can-eat, depending on the day. For authenticity, I loved Yamato in Illovo, near Thrupps. For low-end, I’ve recently enjoyed Huamin near Checkers on Barry Hertzog, but to avoid over ricing, I order the hand rolls. I agree, hand rolls are almost always a good bet.